In May 1947, Paul V. McNutt returned to the United States following his resignation as first US ambassador to the newly independent Philippines. Travelling by way of South Asia and Europe, McNutt reflected on his time in the islands in a memorandum circulated across the State Department. Musing on the significance of American policy in the archipelago, he suggested a ‘lack of appreciation and understanding of our relations to the Philippines’ amongst the decolonizing world. Within an atmosphere of heightening ideological tension and growing calls for self-determination, McNutt stressed the need for a concerted public campaign across Asia and the wider world to educate and enlighten dependent peoples as to the benefits of being in the American orbit. McNutt’s implication – that the world was watching the Philippines – appeared particularly prescient given the amount of interest in the islands’ independence. Western powers like Britain viewed Philippine freedom ruefully, conscious of the implications it could have for galvanising resistance to Western rule in Asia. Postcolonial elites like Burma’s (now Myanmar) U Saw or India’s Jawaharlal Nehru looked on with congratulation and contempt. Indeed, the principal point of attack from America’s emergent rival, the Soviet Union, was that the promise of modernity bestowed upon the Philippines was a sham, and the virtues of communism as a developmental project offered a remedy to the exploitative doctrines of capitalism and Western imperialism. This brief article examines the ways US policymakers like McNutt constructed and contested Philippine independence against competing local, colonial, and international voices. It uses as its axis what is now referred to as public diplomacy, an attempt to purvey a certain narrative or image that aids and informs wider policymaking decisions. It focuses on the administration of Harry S. Truman, and probes attempts by US officials to win friends and influence people in the Cold War battle for hearts and minds by projecting positive images of Philippine freedom across the globe. 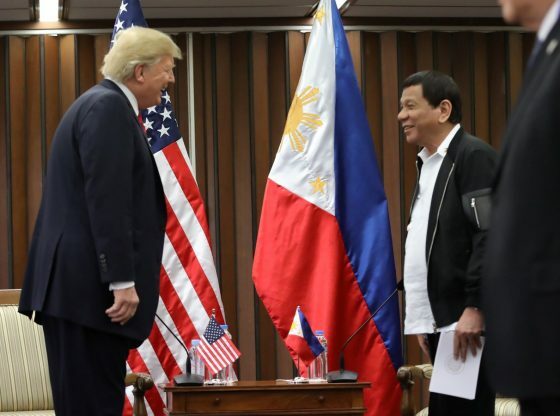 It ends with reflections on this policy’s contemporary relevance to US-Philippine relations, and asks whether the relationship between the two countries could be fractured by an isolated America and an increasingly assertive Asia. After independence on 4 July 1946, Philippine freedom reverberated around the world. American officials were keen to capture a feeling of congratulation and translate it into tangible support for US policy. After all, the legitimacy of colonial control was fast eroding, and the United States was keen to be on the right side of the debate, if only to quell suggestions that America itself was acting imperiously. In this sense, the Philippines held an important place in the United States’ burgeoning decolonisation policy. Since independence, the Philippines has maintained a consistent and compact fraternity with its former coloniser. Today, this alliance remains predominantly cordial, despite the pressures of new global struggles like the War on Terror threatening to open the fissures of dissent. Already considered as a bastion of American engagement with Asia throughout the US colonial regime, Philippine independence was envisioned as a unique opportunity to demonstrate the benignity of American policy in dealing with dependent peoples. Propaganda efforts, including news reels, public meetings, radio interviews and state visits, were broadcast in America, the Philippines, and across Asia. They attempted to highlight the universality of American policy towards dependent peoples, and presented Filipinos as being overwhelmingly grateful for the gift of independence. Despite the Truman administration projecting positive images of independence across the globe, understandings of Philippine freedom were not static, and remained intimately connected with the emergence of a global Cold War. Indeed, competing and contradictory images of Philippine independence developed in America, internationally, and within the Philippines itself. Other imperial powers like Britain viewed Philippine independence with smug satisfaction. One British diplomat sent to witness the inauguration ceremony privately reported the Philippines were independent ‘in name’ only. Other powers took a publicly more caustic tone. Having refused to recognise the new republic, Pravda (the official newspaper of the Soviet state and a vital propaganda organ of the Kremlin) released an article belittling Philippine independence and suggesting America had manufactured the nation’s liberty to further its own imperial ambitions. American policymakers were not blind to such slurs. In Congress, debates over the cost of Philippine rehabilitation clashed with other pressing priorities like aiding Europe, as fears over communist expansion in Asia produced brazen anxieties as to the future of the Philippines without American assistance. In the Philippines, the most visceral pronunciation of opposition to US visions of independence came from the Hukbalahap. Formed during World War II as a peasant-led defence against the Imperial Japanese Army, the Huks were a physical manifestation of popular Filipino frustration with the course of independence. Headed by Luis Taruc, a long-time labour organiser and influential member of the Philippine Communist Party (PKP), the Huks punctured positive affirmations of independence constructed by the Truman administration by playing active roles in the islands’ democratic process. Participating in the 1946 election, Huk candidates made positive showings in the rural heartlands of Central Luzon, where Taruc himself was elected on a platform of land redistribution and agrarian reform. Yet, the group’s apparent connection with revolutionary socialism was enough to concern US diplomats like McNutt, who worked with then presidential candidate Manuel A. Roxas to publicly smear Huk candidates. Ultimately, however, this campaign had its own drawbacks, besmirching the image of America as a neutral arbiter of democracy in Asia and pushing the Huks closer to armed rebellion. In many ways, it is hard to deny the contemporary relevance of America’s Cold War policy towards the Philippines. Indeed, the tone that has captured the “special relationship” between the two countries after independence has been predicated on ideas of informal influence, the crucible of which was formed during the Truman administration’s attempts to ensure Philippine compliance in the Cold War. Since independence, the Philippines has maintained a consistent and compact fraternity with its former coloniser. Today, this alliance remains predominantly cordial, despite the pressures of new global struggles like the War on Terror threatening to open the fissures of dissent. This paradoxically tense and tender relationship was openly played out in 2014, when then US President Barack Obama heralded the ‘deep partnership’ between the Philippines and United States through an unwavering commitment to shared principles of democracy and international security, all whilst protesters burned effigies of the visiting President and demanded immediate emancipation from the yolk of US imperialism. Of course, only time will tell what the future has in store for US-Philippine diplomacy. Yet, for many observers, the frustrated foreign policy of President Donald J. Trump presents one possibility for eroding public confidence. Under Trump, the US is pulling back from the forefront of Asia. Concerns over trade, immigration, and international cooperation have coalesced around his insistent rhetoric of ‘America first’, and US withdrawal from large, transnational trade deals like the Trans-Pacific Partnership certainly suggests an isolationist retreat. Chinese President Xi Jinping’s recent speechat the 19th National Congress of the Communist Party of China acknowledged this sense of diminished leadership, where he pushed for his country to take up the mantle of global leadership in the face of a reengaging America and an ever more assertive Asia. In the Philippines, President Rodrigo “Digong” Duterte has made repeated overtures towards realigning with China, as well as stressing the need for an ‘independent’ foreign policy free from the guiding hand of America. Whatever these developments could mean for the future of American engagement with Asia, US policymakers would certainly do well to remember the power of public diplomacy if they are to successfully capture the imagination of Asian peoples in today’s fractious, multi-polar world. Elliot Newbold is a PhD candidate in the Department of American & Canadian Studies at the University of Nottingham, UK, and a two-time recipient of the Institute of Asia & Pacific Studies (IAPS) Tomlinson Scholarship. His research focuses on the US decolonisation of the Philippines. He also works as an editor at IAPS Dialogue, where he often contributes articles. He tweets @enewbold1992. A revised version of this article appeared on the Asia-Pacific Pathways to Progress Foundation, and can be found here.